Murray and Federer To Face Off In Wimbledon Final : The Two-Way Roger Federer beat defending champion Novak Djokovic to advance to Sunday's championship. He'll face the winner of today's semifinal between Andy Murray and Jo-Wilfried Tsonga. Roger Federer of Switzerland celebrates match point during his match today against Novak Djokovic of Serbia at the Wimbledon Lawn Tennis Championships. Andy Murray has defeated Jo-Wilfried Tsonga to reach the men's final at Wimbledon, becoming the first British man in 74 years to have a shot at winning tennis' oldest and most prestigious trophy. Murray beat Tsonga 6-3, 6-4, 3-6, 7-5. Murray will face Roger Federer in the final. Brits, who anxiously watched the tense match, exploded in rejoicing. One person, posting on the BBC Sports Wimbledon live site described the moment of Murray's win as "Bedlam — merry, ruddy bedlam." "Murray goes cross-court, Murray goes to a place no British man has dared tread in 74 years. Hands to head, disbelieving, cacophony all around. Roof on Centre? It's just been taken off." 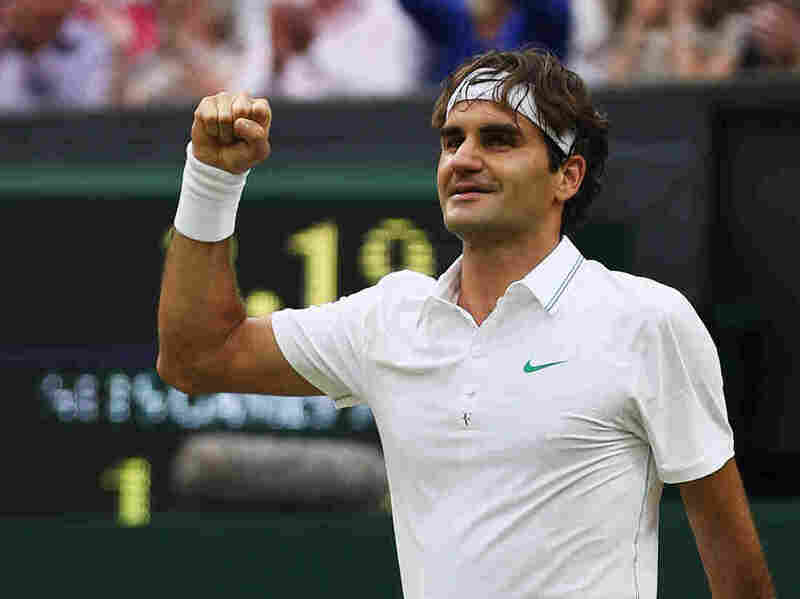 Roger Federer has beaten defending champion Novak Djokovic, advancing to a record eighth Wimbledon final, where he'll face either Andy Murray or Jo-Wilfried Tsonga on Sunday. The Swiss-born Federer defeated six-time champ Djokovic, a Serb, 6-3, 3-6, 6-4, 6-3 on Centre Court. A win against either Britain's Murray or France's Tsonga would see Federer supplant Djokovic for the No. 1 ranking. That would also tie him with Pete Sampras for a record seven Wimbledon titles and 286 weeks in the top rank. William Renshaw, who played in the 1880s, also held seven Wimbledon titles. Murray and Tsonga are playing in the other semifinal later Friday to decide who will be matched against Federer. The women's final between American Serena Williams and Poland's Agnieszka Radwanska is set for Saturday. The men's final is scheduled for Sunday. ESPN is the U.S. broadcaster. Its "breakfast at Wimbledon" coverage starts at 8 a.m. ET both days.